About 30 employees from Universal McCann, an advertising agency, spent a recent day beautifying T.J. Rusk Middle School by painting inspirational quotes, a school crest, and more. Rusk Middle School Principal Juan Cordoba thanked Universal McCann for their support of the campus. “Thanks to their help, our school will have a fresh and inspiring new look when students return in August,” Cordoba said. 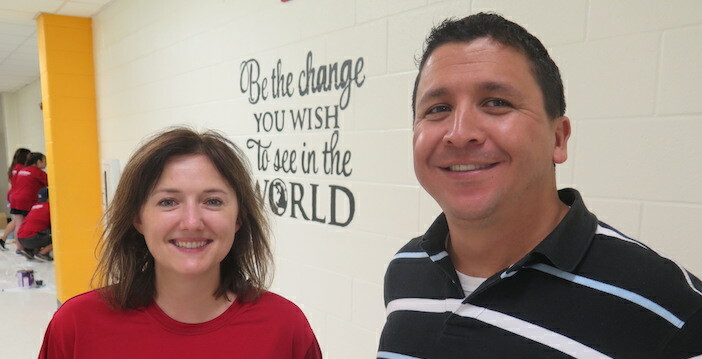 Universal McCann’s Lauren Cole and Rusk Middle School Principal Juan Cordoba in front of one of the school’s new murals. Rusk Middle School is one of the district’s six new ACE campuses, which staffs the highest-need schools with high-performing principals and teachers. Universal McCann employees volunteered at Rusk Middle School as part of its Impact Day, which is when the agency’s offices close for a day so employees can volunteer in the community.